AFHA exhibit opening and special children's event! 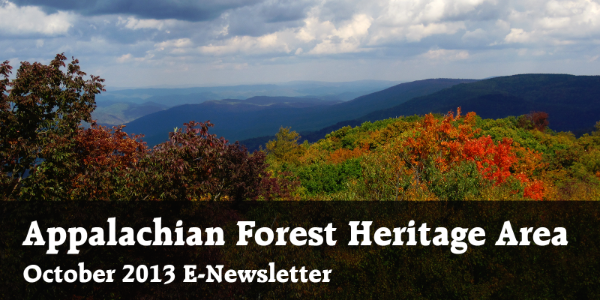 Exciting things are happening in the Appalachian Forest Heritage Area! With our upcoming exhibit opening in the near future, we hope to see you stop by and say "hello." Read below for more details on the event, and let us know if you'd like to get more involved! 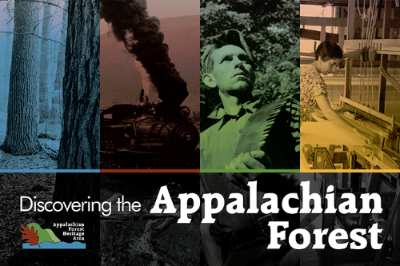 We are very pleased to announce the opening of a new AFHA exhibit, Discovering the Appalachian Forest. Here, visitors can learn about how the forest has affected people, and in turn how people have affected the forest, both historically and today. The public will be able to view the exhibit for the first time during an open house on Friday, November 8th from 4 pm until 6 pm, and again on Saturday, November 9th from 10 am until 6 pm. The exhibit will be on display permanently at the Darden Mill building, located on the corner of Railroad Ave. and 1st St. in Elkins. On Saturday November 9th, from 4 pm until 6 pm, the exhibit's open house will culminate in an event for the whole family: Tucker's Big Bash! 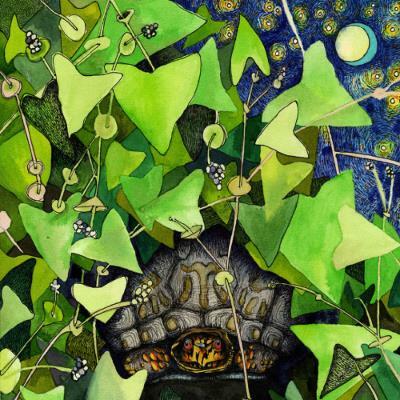 This kid-friendly event celebrates Tucker the Turtle and his new book, "The Pests that Girdle the Home of Tucker the Turtle." 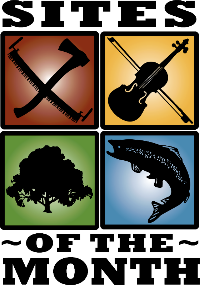 The book is a project of AFHA and the Potomac Highlands CWPMA, and was created to teach children about non-native invasive species and the threats they pose to our forests and other natural environments. Illustration of Mile-a-Minute, a non-native invasive species featured in "The Pests the Girdle the Home of Tucker the Turtle." Illustration by Molly Swailes. The event is free admission and includes crafts, snacks, book readings and more. The new book will also be available for purchase with optional book signing. And there's something for the adults, too: the original sixteen paintings, created by AFHA AmeriCorps member Molly Swailes, will be auctioned off during the event. Proceeds will go to further development of the AFHA exhibit and the future Appalachian Forest Discovery Center. Book proceeds will go towards non-native species educational outreach. Questions? Please contact Molly Swailes at 304-636-6182, or via email at info@appalachianforest.us. For queries regarding Tucker's Big Bash, please email tuckertheturtle1@gmail.com. Delia Delgado, an AFHA AmeriCorps member, is serving with the Marlinton Ranger District Office in West Virginia. 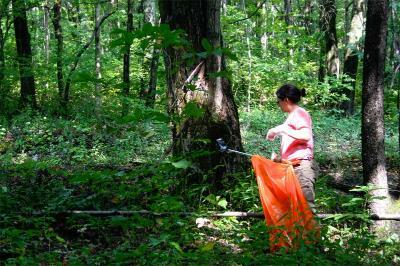 Pictured here, she is assisting with clean-up near the Rich Mountain Battlefield site in Beverly, WV. Photo: Stephanie Petersen. In the short time since I moved to West Virginia from Ohio, I have ventured into the woods as much as possible. While exploring, I found myself encountering a unique, but unfamiliar shrub. After further investigation, I identified it as hobblebush, scientifically known as Viburnum lantanoides (syn. alnifolium). The beautiful fall colors and distinctive appearance of hobblebush inspired me share what I’ve learned about it with anyone who might be interested. Hobblebush is a less common but unmistakable native understory shrub that anyone can easily learn to identify. If you have spent much time in the local forests, you are probably already familiar with hobblebush. The geographic range of hobblebush extends from Nova Scotia west to Ontario, south through the Appalachian mountain and maritime states to Tennessee, Georgia, and the Carolinas. In this part of its range, hobblebush is found at mid to high elevations in moist, shaded woods, along streams and cool ravines in well-drained soils. Since I have been on the lookout for hobblebush, I have found it noticeably absent in some areas. Where I do see it, it is usually present in significant numbers. Hobblebush is a straggling shrub, that may reach as high as 10 ft., but is more often found much lower to the ground. Its name is said to come from its wide-stretching, low-hanging branches that bend to the ground and sometimes root at their tip, hobbling passersby. The leaves of hobblebush are arranged oppositely and are large (3-8 in.) and broadly egg-shaped, with a heart to round-shaped base and sharply pointed tip. The leaf margin is finely toothed and the veins are pinnately arranged and noticeably sunken from above. The leaves are smooth above and hairy and lighter in color beneath. 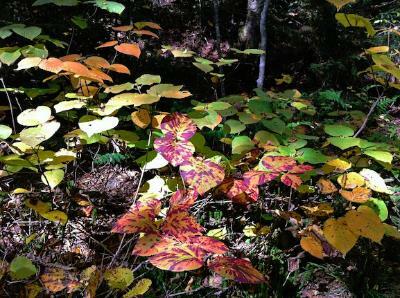 The kaleidoscopic leaves pictured here are what ultimately inspired me to write this article. Photo: Delia Delgado. Fall leaves range in color from bright yellow, to rose-gold, to pink-purple. Interestingly, just as the leaves of hobblebush are changing color and ready to fall off, it often puts out a second, short-lived set of leaves. These leaves are smaller than the first set, but allow the plant to catch the surge of sunlight that filters down as canopy trees lose their leaves. 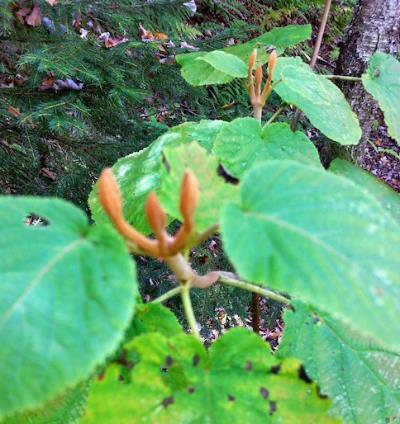 Even after the leaves of hobblebush have fallen, its distinctive buds reveal its identity. The rusty-tan buds are around 1 in. long, and are stalked, naked (not covered in scales), and hairy. Hobblebush buds. Photo: Delia Delgado. In the spring hobblebush puts out its leaves early, to catch as much sunlight as possible before the canopy fills in. It blooms in May-June and its flowers are on stalked, flat-topped heads 3-5 in. across. The unique flower heads bear showy white sterile flowers on the outside that border smaller green-white fertile flowers on the inside. Fertilized flowers develop into clusters of drupes, first green then turning bright red and eventually purple-black when they ripen in late summer. Hobblebush twigs and foliage are a favorite of deer, and can be scarce in areas with high deer populations. Various birds and mammals feed on the berries of hobblebush, which can be enjoyed by humans as well! As the seasons change and I explore these magnificently diverse forests, I hope to become better acquainted with the habits of hobblebush. I look forward to watching the spring blooms and to tasting the late summer berries. I find the more I get to know plants, the more I feel surrounded by friends wherever I go. I hope you too have the pleasure of making hobblebush a friend. Swallow Falls State Park borders the beautiful Youghiogheny River and offers among the most breathtaking views in Maryland. The park is home to the 53 ft. high Muddy Creek Falls, the tallest drop waterfall in Maryland. Swallow Falls State Park contains the oldest eastern hemlock and white pine groves in Maryland. The 37 acre virgin section has been designated as a sensitive management area with trees thought to be over 350 years old. The park hosts countless opportunities for hiking, biking, picnicking, and camping. The Old Hemlock Foundation maintains 230 acres of real estate along the Brandonville Pike in Preston County, West Virginia. It was was the home of George Bird and Kathryn Harris Evans. George was a noted artist, author, outdoorsman, and dog breeder, and Kathryn co-authored and edited his books. The property contains virgin hemlock trees and was intended be maintained in its natural state as a nature and wildlife preserve. The house on the property was built in 1782 and is the oldest residence in its state of preservation in Preston County. Tours may be arranged for small groups or individuals. The Randolph County Community Arts Center was formerly the St. Brendan’s Catholic Church, which served the Elkins Catholic community until 1999. The building features locally quarried sandstone blocks on the outside with a border of stone relief angels around the entire building. In 2000, the Randolph County Community Arts Council purchased the building, renovating and reopening it in 2001. Today, the Arts Center offers live concerts, dances, performances, classes, and workshops, as well as exhibits throughout the year. Rocky Gap State Park is located in Western Maryland’s Allegany County. The park encompasses over 3,000 acres of public land for visitors to enjoy. Rugged mountains surround the park, featuring 243-acre Lake Habeeb. The lake is fed by Rocky Gap Run, which winds its way through an impressive mile-long gorge, displaying sheer cliffs, overlooks and a hemlock forest dense with rhododendron and mountain laurel. Overlooking the lake is Evitt’s Mountain, named for one of the first European settlers in Allegany County. You are receiving this email because you have expressed interest in AFHA at some point.